If you have an injured leg or if you have undergone a surgical procedure in your foot or leg, you may be advised to use crutches. In general, for walking with crutches, your upper body should be strong. You should also have the required flexibility for using them. But, if there are injuries in both the legs or if there is an injury in the arm, crutches cannot be used. You need a different type of support for such problems. The following tips may be helpful for using crutches. The size of your crutches should be appropriate, and this means that you should not face problems while walking with crutches. When you stand upright, their position should be about two inches from your armpits. Likewise, the handles of the crutches should be at hip height. This will help you in grasping them comfortably and tightly. Your elbows will bend slightly while you hold the handles. If the crutches are not of the appropriate size, you cannot use them comfortably. There should be ample cushion on the crutches. Otherwise, there will be discomfort under the armpits and also when you grip the handles. Even the base of the crutches should have sufficient cushioning. If these cushions wear out, you can get them replaced. While walking with crutches, you should first move both the crutches to a comfortable, short distance. The body should swing forward, for which you should get the support with your hands. When you swing, you should move as if you will be using the injured leg first, though, in reality, you will not be using it. During this process, your weight should rest on the handles of the crutches. The support should come from your hands and not by allowing the crutches to touch your armpits. In fact, the crutches should not rest on your armpits even while resting. You should then move your normal leg forward by swinging it and place it on the ground in front of you. By shifting your weight to this normal leg, you can start the next step. During the whole process, the crutches should be kept a little away on the sides so that you can have more room. You must focus on your direction and not on how you move your feet. To buy crutches, the best way is to search online and find out the manufacturers and dealers of crutches and crutches accessories. You should have your specifications ready while doing your search. You can compare the features as well as the costs and choose the most appropriate one that suits your specifications and budget. But, you are advised to bestow more attention on the size because if you buy crutches of the wrong size, you may face utmost discomfort while using them. Even after buying them, you should slowly practice and learn how to use crutches. Once you learn it, you will not face any problem while walking with them. 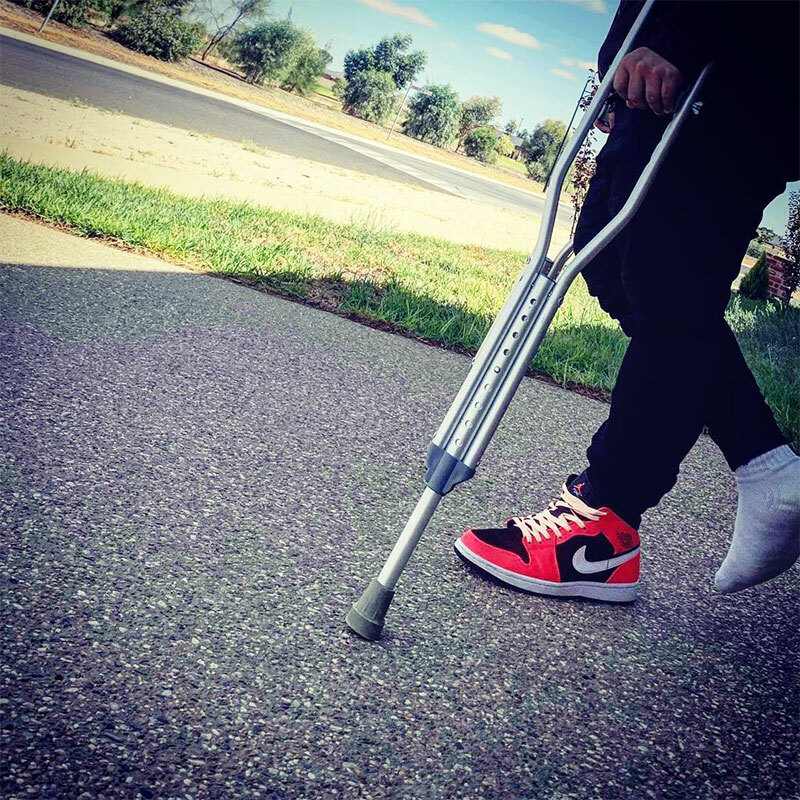 If you have a temporary disability that has occurred due to a recent accident, you must be on the lookout for walking crutches that are available in the market for complete assistance. 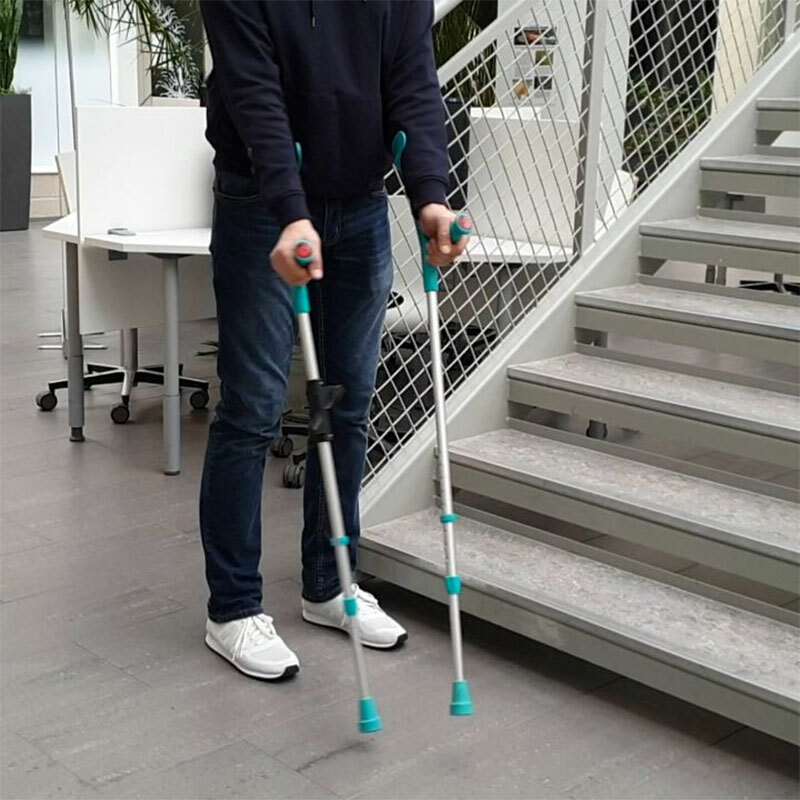 Usually, a therapist or the doctor will prescribe a particular model of crutches in order to provide you the opportunity to walk freely without help from other individuals. There are many models that are present in the market that is manufactured by different companies. You are required to choose the one that will provide you with complete comfort and convenience while you’re walking ahead with the help of crutches. One can find different models of walking crutches in the forearm crutches category and the underarm crutches category. Underarm crutches are usually prescribed for individuals who are suffering from a temporary disability. These crutches offer convenience to the user with the help of pads that are available to place at the topmost layer of the crutches. They are then held against the rib cage under the armpits for which the user will be holding onto the crutches to the grip that is provided parallel to the pads. Pads for crutches are an important part of the equation, as they provide comfort to the user as the clutch is held under the armpits against the rib cage. In order to find out which is the best crutches accessories store, you are required to carry out a bit of research. There are many websites present over the Internet which provides complete details about walking crutches and the different models that are available. Understanding every model will be very helpful in choosing the one that will best fit the requirements of the patient. Once this step has been carried out, the next step is to look out for the best store that offers quality products. After choosing the best pads for your crutches, you can also be on the lookout for crutches covers that will be helpful to cover the pads, depending upon the design of the crutches and the color of the crutches that you have chosen. Another important factor that you will have to understand here is the crutches cushions. The cushioning effect is an important factor for attaining complete comfort. As there are different materials that are used in manufacturing a cushion, choosing the right product depends upon the user’s comfort preferences. It is very important for you to look for the best walking crutches that are available in the market. As there are different models present, it is necessary to understand which model will be perfectly suited to a particular recovery program. Depending on the disability, one will have to carry out the research about the best model that will provide maximum comfort to the user. Every model provides a different level of comfort to different users. Checking out the reviews provided will provide an idea about the level of comfort a particular model provides. It is also important to check the reviews provided by the users. Now that you have all of the appropriate information so that you can completely understand about walking crutches and various crutches accessories, it is time for you to research in order to come across the best store that will offer you quality products. Though the doctor may have prescribed a particular model for the patient, you’re required to choose the one that will provide you with complete comfort and ease of operation while walking. Carrying out the research will also be helpful as you will come across reviews that are provided by different users that are utilizing a particular model of walking crutches. It is also very important to be on the lookout for a reputed company as they will provide complete assistance to their clients. Apart from this, one will also have to check out the best deals available in the market who will provide quality products and also at the same time offers complete assistance. One can also research to find out a reputed dealer in a particular area. You can then contact the dealer to ask whether a particular model from a company is available or not. You can then plan to visit the store to look at the model and test it for its comfort.